Using KPI data to manage any process is essential if the goal is to improve OEE while optimizing cost. The problem happens when you are using incorrect data to make decisions. In this video we tell the story of an Automotive Parts manufacturer that was using RI to manage the concentration in their sumps. Operators had strict SOP's, with their corrective actions clearly defined. The problem is, what they were measuring as concentration was really contamination, so no fluid additions were being made. Fluid Performance degraded, OEE dropped and the facility was struggling to meet their production and quality targets. Data Verification and Validation is a critical step in the Plan-Do-Check-Act Management process. There can be many reasons why the data a plant uses can be wrong, however its critical to know that the information being used to make critical decisions in both accurate and timely. This facility spent time, money and critical resources managing to an incorrect metric. Regular data validation together with the interpretation of supporting/related data, is the only way to be sure that the process performance and operating costs are optimized. 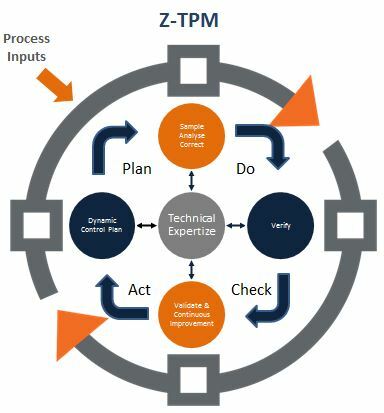 Built into the Z-TPM Process, data verification and validation is performed and measured daily.